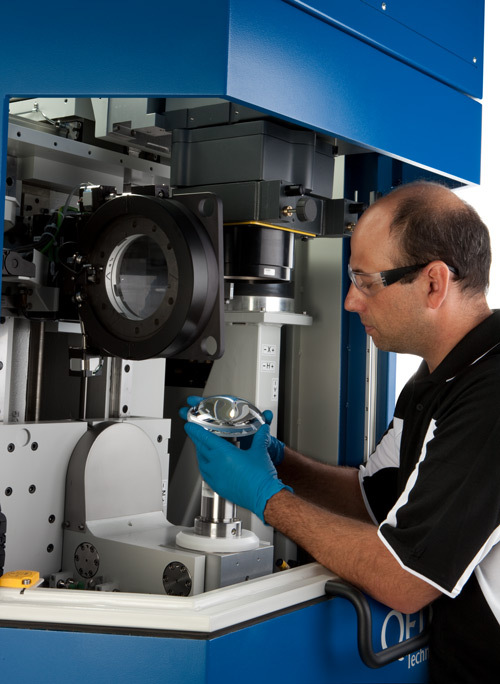 SSI technology is a powerful and flexible metrology process for precision optics manufacturing. Using SSI technology improves the accuracy, resolution, reproducibility and reliability of your measurements, and in turn, improves manufacturing productivity, efficiency and yield. Intuitive and easy-to-use, systems based on SSI technology fit seamlessly in your shop. They can be used as both in-process metrology tools and final quality control measurement systems. The key to the QED’s revolutionary metrology capabilities is subaperture stitching. The stitching process reconstructs a full-aperture map of a surface from a collection of smaller (subaperture) maps, each covering only a portion of the whole surface. While this would be straightforward for flat (plano) optics, it becomes much more complicated for non-flat surfaces, especially for aspheric shapes. Advanced software and hardware developments enable, with very high accuracy, an automated, subaperture metrology solution. QED’s stitching algorithms use an advanced optimization method to minimize the discrepancies between overlapping regions of subapertures caused by several sources of systematic and random measurement error. Through its integrated calibration capability, the system can deliver better accuracy than a standard full-aperture test. QED combines interferometry, patented stitching algorithms and software to automate the entire package. Integration of the measurement design, motion control, phase data acquisition and data analysis allows complex stitched measurements to be made with a simple push of a button. With SSI metrology technology, experience accurate, high resolution, reproducible and reliable measurements of high-precision optics.